How Efficient Can Toilets Become? California goes one step further on toilet water efficiency. The next time you have a moment alone with the porcelain throne, think of this: toilets still take the cake for the most water use of any indoor water appliance, despite significant water efficiency gains in the past few decades. Toilets used to use multiple gallons of water for every flush, but the U.S. Environmental Protection Agency has set the current limit at 1.6 gallons per flush (gpf). California, as usual, is already out in front of the federal standard and is moving even further. In 2007, the legislature enacted AB 715, which called for water efficiency standards of 1.28 gpf for toilets and 0.5 gpf for urinals. There is now a proposal to codify the legislative action in the state’s energy efficiency Title 20 standards. The standards will also go one step further and introduce the first-ever standards for replacement valves, which should help accelerate the transition to low-flow toilets, and to introduce even more aggressive standards for urinals: 0.125 gpf. The replacement valve standard is not as strict as the standard for new toilets and urinals; the valve cannot exceed 1.6 gpf for toilets and 1.0 gpf for urinals. The change to Title 20, rather than just the legislative action, would mean that products cannot be sold in California that do not meet the standards. The resulting lower water usage is not insignificant for energy costs, either. The California government estimates that nearly three trillion gallons of water per year go to urban uses, which include outdoor and indoor residential, commercial, institutional and industrial applications, along with water that is lost to leakage. It takes approximately 26.5 terawatt-hours of electricity to collect, move and treat that water. A single residential toilet uses about 35 kilowatt-hours per year. “Establishing efficiency standards for toilets and urinals will have a significant impact on California’s overall water and embedded energy use,” Tracy Quinn of NRDC wrote in a blog post. In homes and businesses, toilets still account for about 30 percent to 40 percent of indoor water use, despite the efficiency gains. Toilets, in other words, are the water-use equivalent of an HVAC system's electricity load. In California and in other states, low-flow toilets have long been on the market. Also, there's not much price difference between 1.6 gpf and 1.28 gpf, according to EPA’s WaterSense. The real differences in cost, according to a report by the California Energy Commission, are linked to optional features, not flush volume. 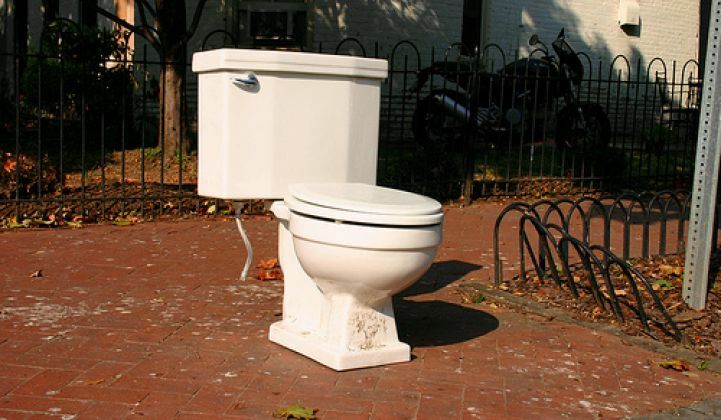 California is not alone in adopting some of the most stringent standards in the nation for toilets. Georgia and Texas also have the 1.28 gpf standard, according to the Appliance Standards Awareness Project. If the federal government followed suit by imposing a similar standard, it would save 92 billion gallons of water and $4.3 billion through 2035. Driving higher water efficiency for appliances is also just the beginning. Eventually, we will all have to think of the municipal water cycle, and wastewater, differently. In California, one municipality already has plans to recycle wastewater for city use, and maybe eventually to go back into taps.